The craziest thing happened recently. The roots of the story go all the way back to when my son was just a baby. He nipped at the heels of his three-years-older brother, as obsessed (or more) with anything round. If it could be picked up and thrown, they would find it; and it would fly. We tried to send them outside, and incorporated a worn-grass, diamond-shaped baseline into our landscaping. But in the middle of a snowstorm, when the addiction called their names… The balls I let them use inside became softer and softer as they grew, until I allowed little more than cotton balls. Still, I gave up before the oldest turned ten, surrendering the glass fronts of original 1916 built-in cabinets to their mania. I fixed a glass door once, then ruefully noticed new cracks. Someday, after they move out, I’ll restore the cabinets. And our plaster walls – well, the youngest learned early how to repair them after a bat somehow collided with one. 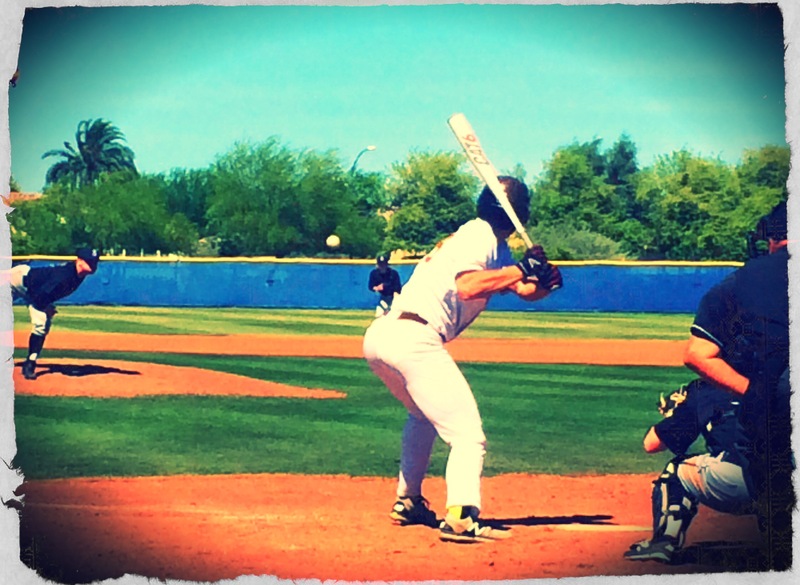 By the time our youngest baseball player started high school, we grew accustomed to dodging a swinging bat as we moved around our house. The sound of a ball bouncing off a wall punctuated the soundtrack of daily life. Our son started on our local high school’s varsity team during his freshman year, which was all too fun since our oldest was playing his last year before graduating. After that year, in one of those parenting evaluations where we note each kid and his/her challenges and progress, we discussed our son. We prayed right there and then for God to provide an opportunity equivalent to his drive and passion for the game. Even we were surprised by the answer to our prayers. Within a week, a coach called out of nowhere and recruited him for a baseball club with national exposure. His infatuation only increased as he played far and near. Last year, during his sophomore year, we watched as some of his teammates gave verbal commitments to various universities. We wondered if his chance would come. Then, this past fall of his junior year, he connected with a couple coaches. He talked to them regularly, sent them videos and test scores, attended recruiting camps, and landed on their “watch lists.” The next step was to notify them which summer tournaments he would play with his club team so they could see him in game situations. It was one of those fun rides you don’t talk about much because you don’t want to jinx it. As a parent, you are hyper-aware of how fragile it is, and also how few kids who love the game ever get to take those steps. Our son worked hard during the off-season. He severely limited his food, no sugar or junk, and worked out daily. He is incredibly self-motivated. He gained 25 lbs of sheer muscle and was poised to play the season of his life. And then the unimaginable happened. A few weeks ago, pitching the opening game of the high school season, around pitch number 55 on a seasonably warm spring day, something snapped with one throw. He’s not given to emotional display and readily plays through pain without a mention, so when he grabbed his elbow on the mound, I knew it was serious. A couple weeks later, we sat in the orthopedist’s office as he delivered the worst possible news – our son’s throwing-arm elbow-ligament is completely torn. In the baseball world, “Tommy John” is the equivalent of a curse word. You just don’t talk about it. The doctor, understanding the gravity of his diagnosis, didn’t even say the phase. But we understood. Tommy John surgery, for the non-baseball aficionados, is a reconstruction of the UCL with a tendon borrowed from the wrist and requires intensive rehab for a year. While it’s common fare for the pros, knocking a kid out of the recruiting process during his junior year could spell the death of a dream. In fact, surgery might not even be worth it because the ligament isn’t needed for every day life outside certain sports; and our son will re-emerge well after recruiting ends for his class. As shock gave way to reality – wow, we really are alive and awake in this moment, it isn’t a nightmare, we are all three pinching ourselves and we are still all here together – we went to a coffee shop after the appointment to talk. And, there, my son and I started laughing. It was one of those crazy moments when the situation is so opposite of everything you would hope and pray, so ludicrous, that it is absolutely hilarious! It’s a space I’ve experienced before. While adopting our youngest daughter from Kenya, I noticed the strangest, unmistakable pattern. If I prayed something, I could expect God to answer the opposite. It was too consistent to be coincidental. If it could go wrong, it would. Seven-and-a-half-months later, the tide turned. Finally our prayers to go home together were answered. Within a year, we saw clearly what God was creating through all those twists and turns as Sanctuary of Hope opened. Sometimes in life we get to understand why the healing doesn’t come, why answers to our prayers flip upside down; and sometimes we don’t. In the case of our daughter’s adoption, God pulled back the curtains of eternity and let me see. The news about our son’s injury felt similar, the exact mirror image of all we hoped and prayed. Up until that moment when the doctor announced the words “Tommy John,” I could only pray for healing. And I believed without a doubt it could happen. I knew I should pray for the Lord’s will to be done, but I just couldn’t make my heart go there. Strangely, though, once the verdict was delivered and I found myself in a most shocking desert, I also felt this swelling sense of expectation. It’s like the Story-teller is stacking the odds against the protagonist: adding in an extra ominous swamp, an especially cursed forest, a super-sized dragon. We found out the news on Friday and left on Sunday for our annual baseball pilgrimage to Arizona with our son’s high school team. With his arm as badly damaged as it can be and no risk of further injury, he could bat; but, of course, he could not play in the field. My husband and I circled the wagons each night and let our son process grief, hope, and what is next. Within a couple days, he charted his course. He doesn’t want to have any regrets about what might have been. He will go forward with surgery. I welcomed the desert landscape of AZ as a tangible reflection of my current inner journey; and, even more so, the setting of Lake Pleasant, about a half-hour drive outside Phoenix. A large body of water suddenly intruding upon stark desert hills issued a promise I eagerly embrace. Somehow, in this most unexpected place, water will seep into the fissures of my son’s dream. And not just a quick run-off after a desert rain. There will be a reservoir. I am sorry to read about your son’s injury. I wish all the best with the surgery. Thank you so much Otto! Your concern is much appreciated. Wow! What an intense and painful desert to be thrust into unexpectedly. Yet I admire how you’re all processing it together, and I hope with you for the reservoir. Thank you so much for praying and believing with us Joanna! Praying and believing for that reservoir!! Eph 3:20,21. And Romans 11:33 Oh the depth of the riches of the wisdom and knowledge of God! How unsearchable are His decisions and His paths beyond tracing out. Amen and amen. Thank you so much Becky. Justin has a reservoir of stability that I can’t take any credit for, God just knit it into him. He’s an inspiration to me!